One unusual experience all end-of-season regattas have shared this year is a lack of wind, and Les Voiles de Saint-Tropez was no exception with many races cancelled during the regatta that took place between 24 September and 2 October. However, this did nothing to diminish the spectacle on the water of a 300-plus fleet of glorious old dames and extraordinary modern racers. Despite the lack of wind, a minimum number of races had to be completed to obtain the final rankings in each class and to award the trophies. The most prestigious of these is the Trophée Rolex for classic yachts over 16 metres on deck, and in this Tradition Division there were no less than 51 yachts participating this year. The overall winner of the regatta was Avel, a gaff-rigged cutter designed by Charles E Nicholson and built by Camper & Nicholson in 1896. 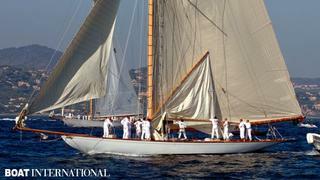 Being one of the main regattas of the season, Les Voiles de Saint-Tropez was graced with the presence of many prestigious yachts, among them Cambria, Tuiga, Altair, the Moonbeams, Mariquita and the magnificent J Class Shamrock V. Another remarkable sight on the main pier of the harbour was first-time participant, the Wally 130 Angel's Share. In addition to the regatta participants, an impressive fleet of superyachts was anchored off the harbour including the neo-classic 90 metre Nero, the timeless Talitha sporting the prestigious White Ensign, two three-masted schooners – Adix and Creole, Avel's mothership - and some recently launched yachts among them the Feadship Lady Christine, the Lürssen Lady Kathryn V and the Heesen Ice Angel. Most of the fleet at the regatta have made a date to return in 2012, but next time… with the wind!